Options betting suggests that shares of AT&T rise following results. The technical chart suggests the stock rises by as much as 7%. Focus will still be on its entertainment unit. AT&T (T) is expected to report results on April 24 before the start of trading. The stock has been slowly grinding higher over the past several weeks, and all indications suggest that it's likely to continue, based on the technical charts and options betting by as much as 7%. The last time I wrote on AT&T was on March 28 noting AT&T's Stock is Nearing a Big Breakout. Since that time the stock has broken above that critical level of resistance, increasing from a price of roughly $31.20. Now the stock has earnings coming, and the options for expiration on May 17 are indicating the stock rises or falls by about 5% from the $32 strike price. It means that the options market is not expecting any big surprises when the company reports results. However, the calls at that strike price heavily outweigh the puts by a ratio of about 2 to 1, with approximately 38,000 open call contracts to roughly 19,000 contracts. It would indicate there's an overwhelming number of bets for the stock to rise. Additionally, the calls at the $33 strike price have seen increasing levels of open interest. The number of open calls at that strike price has risen to more than 27,000 contracts. A buyer of the calls would need the stock to rise to around $33.40, an increase of about 5% from the current stock price of roughly $32.00. 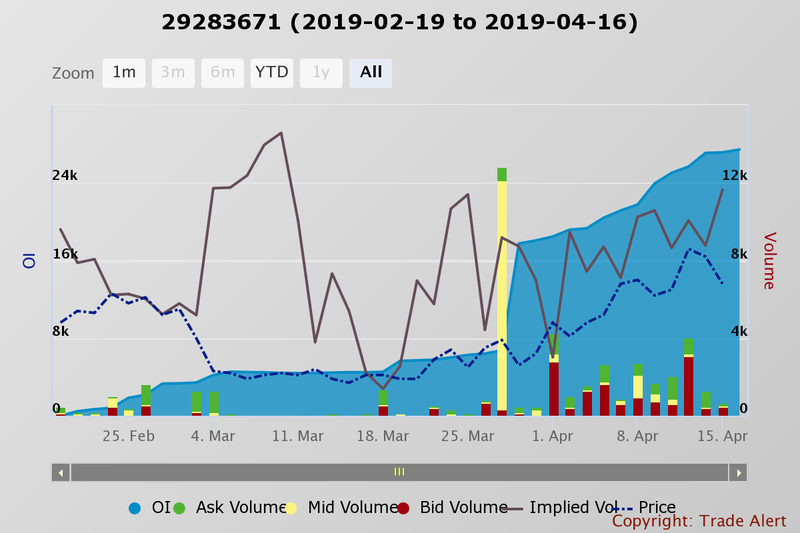 The chart shows that the stock has now risen above resistance at $31.80 and that may be a signal that the shares continue to increase to perhaps $34.25, a jump of nearly 7%. The relative strength index also is trending higher, suggesting that the bullish momentum continues to flow into the stock. Analysts are not forecasting a strong quarter for the company and estimate that earnings climbed by 1% to $0.85 per share. Revenue is expected to have grown 18.6% to $45.2 billion, with most of the growth due to the acquisition of Time Warner. 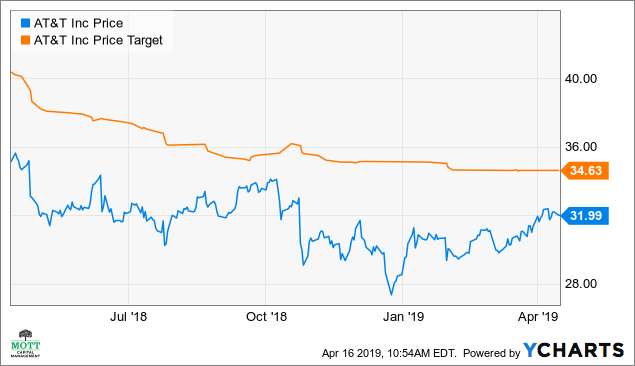 Currently, the average analyst's price target on the stock is around $34.60, based on data from YCharts. But that doesn't mean this quarter doesn't carry risks, especially after last quarter's DirecTV issues. This business unit will continue to be a primary focus for investors when they report results. 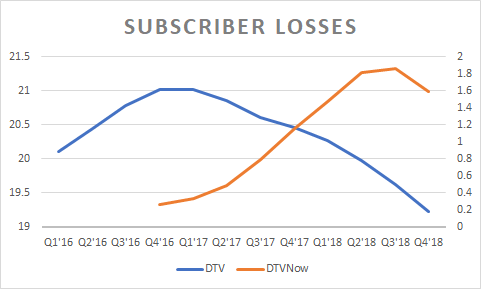 AT&T's DirecTV and DirecTV Now saw subscriber losses last quarter, a disturbing trend for both units. What was most concerning last quarter is the new streaming service DirecTV Now saw subscriber losses. This unit is supposed to be DirecTV's answer in the fight against cord cutting. If this shows weakness, again it could cause even further anxiety among investors for the future of DirecTV. Additionally, investors will be focused on how AT&T's Warner Media Group, which saw revenue for HBO fall last quarter, while the Turner group revenue dropped as well, as I noted in my previous article. Investors also will be paying close attention to AT&T's big debt level which stood at more than $176 billion at the end of the fourth quarter. 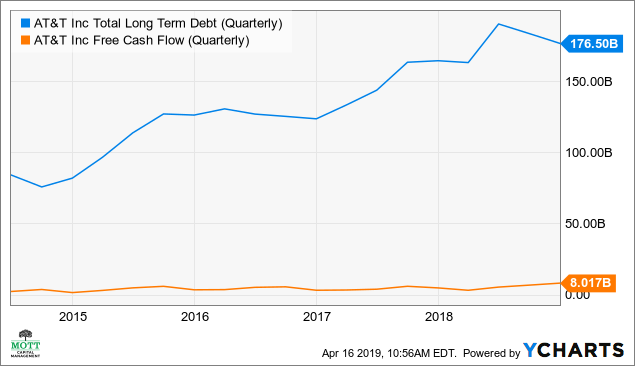 Investors will be particularly interested in the amount of free cash flow the company was able to generate during the quarter, and how it plans to pay down that debt. AT&T just recently sold its stake in Hulu for $1.4 billion and plans to use the proceeds to pay down some debt. Will the company need to sel off other assets as well to pay down more debt? It will make for an interesting and potentially exciting quarter for AT&T. If DirecTV and Warner can show they have stabilized or even started to grow again, it could provide a big catalyst to the stock. It may be one reason why the options and the charts are pointing to higher prices following results.